Skinner, Inc. Announces Fine Musical Instruments at Auction on April 26th | Skinner Inc.
BOSTON, MA – April 13, 2015 – Skinner, Inc., the only American auction house hosting in-person auctions of high-quality musical instruments, is pleased to announce its next Fine Musical Instruments auction on April 26th. This sale will feature nearly 400 lots, highlighting a strong selection of violins, violas, bows, and cellos, a small but intriguing collection of ukuleles, fine woodwind instruments, collectible publications, sheet music and more. “This auction offers every player the opportunity to own a high-caliber instrument, from the professional musician to the amateur or student,” said Jill Arbetter, Director Pro Tem of Fine Musical Instruments at Skinner. Leading an offering of exceptional violins are a pair of instruments by important modern Italian makers: a 1920 violin by Gaetano Sgarabotto, (Lot 18, Estimate $34,000 to $38,000), and a 1926 violin by Paolo De Barbieri, one of the best of the Genoa school (Lot 23, Estimate $30,000 to $36,000). Also available is a 1921 French violin by Paul Kaul, boasting a beautiful wood grain and accompanied by an authentic letter by Kaul (Lot 13, Estimate $6,000 to $8,000). 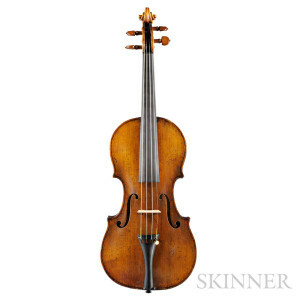 Highlights also include a desirable Italian viola, created by Igino Sderci in Florence in 1973. Inscribed by the maker, this viola has excellent sound quality and is in perfect condition, making it an ideal choice for concert violists (Lot 17, Estimate $16,000 to $20,000). Sure to excite, as well, is a fine 1841 violoncello by Charles Francois Gand (Pere), (Lot 21, Estimate $50,000 to $70,000), an exquisite instrument arriving with a beautiful French bow. The instrument was consigned by Arthur Pardee, preeminent American scientist at Harvard. Skinner is also pleased to offer a German double bass (Lot 81, $3,000 to $5,000), an uncommon auction highlight. Several examples of fine bows can be found throughout this auction. One noteworthy highlight is a French gold-mounted violin bow by Lupot (Lot 49, Estimate $5,000 to $7,000). 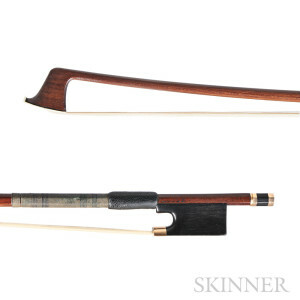 Ideal for a serious violin player, according to Jill Arbetter, it is one of the most beautiful bows to come to auction at Skinner. Another extraordinary piece in this sale is an English silver-mounted violin bow, crafted by James Tubbs (Lot 65, Estimate $4,000 to $6,000). Both bows are offered with their original certificates. A stellar grouping of over one dozen William Hill bows will also be up for auction, sure to please players and collectors alike. Several varieties of Hill bows at a range of price points will be offered, including stamped bows, silver bows, gold bows and more. 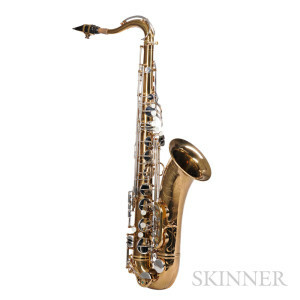 Skinner is pleased to offer a custom-made, mint-condition 1952 saxophone by Henri Selmer (Lot118, Estimate $6,000 to $9,000). The instrument is owned by Jim English of Marlborough, MA, a veteran who played the saxophone during his time in the army band. A rare find, it boasts two-tone nickel and gold-plated keys. Attractive guitars are well represented, including an example by Boston maker Charles Stromberg (Lot 12, Estimate $2,800 to $3,800). Skinner is also pleased to present a small selection of ukuleles in this auction, with varying dates and estimate ranges. Exciting standout items include a 1930 Kamaka pineapple ukulele as well as a Martin ukulele. Previews will be held on Friday, April 24th, from noon to 7 P.M., Saturday, April 25th, from 10:30 A.M. to 5 P.M., and Sunday, April 26th, from 9 to 10 A.M. Illustrated catalog #2806B is available from the Subscription Department, at 508-970-3240, or from the Gallery. Prices realized will be available online, at www.skinnerinc.com, both during and after the sale. The Skinner website enables users to view every lot in the auctions, leave bids, order catalogs and bid live, in real-time, through SkinnerLive! This entry was posted in News and tagged American violin, cello, cello bow, fine violin, french bow, Gagliano, German bow, guitar, Italian violin, Jill Arbetter, modern violin, Musical Instruments, Pressenda, saxophone, skinner, stringed instruments, ukulele, usic, viola, violin, violin bow by Skinner. Bookmark the permalink.